In honor of Chinese New Year, we’ve been trying a few new Chinese style recipes at home, and this Sweet and Sour Chicken was both easy AND delicious. The chicken was incredibly moist, probably because that quick frying locked in all of the juices. Yum! The best thing about this recipe is that it uses ingredients I've almost always got on hand. Note: Sauce can be doubled if you like to have extra sauce on the side. Just heat the extra sauce in a small pan over medium heat, stirring often, til thickened. Cut boneless chicken breasts into chunks. Dip chicken in egg and then in cornstarch mixed with salt and pepper (to taste). Fry chicken in a small amount of oil until brown but not cooked through. Place chicken in a single layer in a baking dish. Mix sauce ingredients together and pour over chicken. Gently toss to coat. Gently stir chicken every 15-20 minutes so it is evenly coated with sauce. Recipe modified from Mel’s Kitchen Cafe. Wash and snip the ends off of a bunch of fresh green beans. Cook beans in a steamer until their color changes to a darker green, but still crispy. Meanwhile, melt a tablespoon or two of butter in a small saute pan. Add a spoonful of garlic (I think I used about a half tablespoon) and cook for 2 minutes. Toss green beans in the garlic butter and add pepper and freshly-ground sea salt to taste. 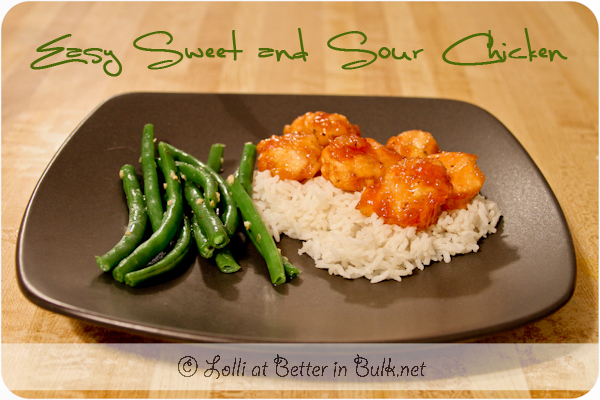 I thought I made the best sweet and sour chicken I’ll have to try this recipe looks amazing… Thanks!